1) Die cut a heart window from the front of a kraft cardstock base. 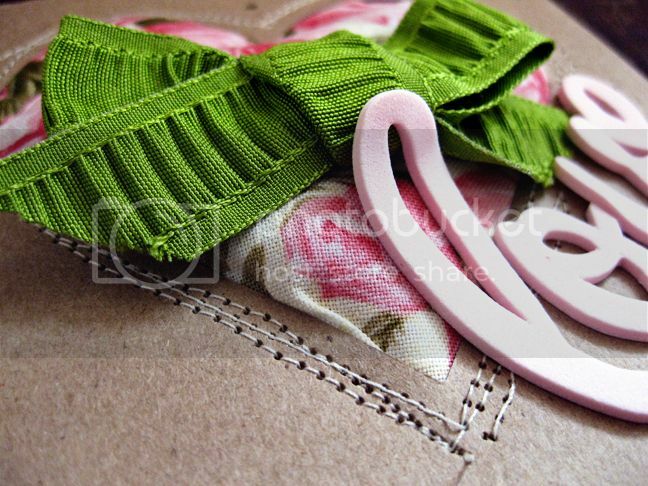 2) Stitch a piece of floral fabric to the window, letting it bunch so you can fill it with fabric scraps/polyfil. 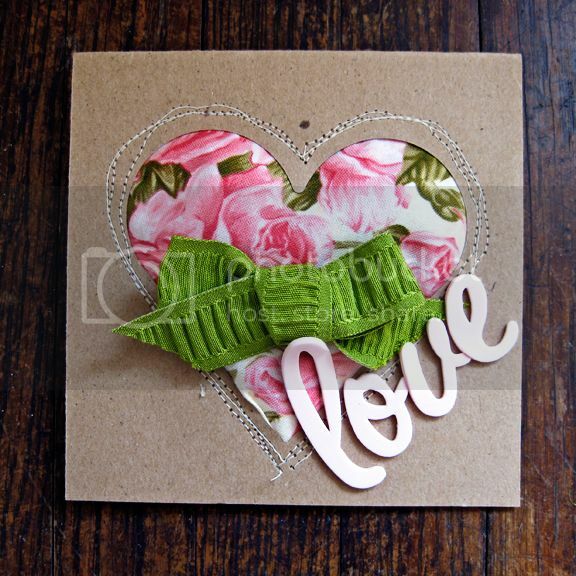 3) Turn the card over and fill the fabric heart with scraps of fabric or polyfil. Adhere a piece of cardstock to the back to keep the fabric scraps/polyfil in place. Tip: When I sewed around the heart the first time to attach the fabric, it looked really sloppy, so I went around the heart two more times after the cardstock was attached to blend in the imperfections. So not only did the cardstock get attached permanently but my sloppiness got blended in. Sa-weet. 4) Add a green ribbon bow to the bottom of the puffy fabric heart and place "love" pink foam letter stickers on the side. Love, Love LOVE this card!!! So fab! The stitching is just perfect! So cute! You're using fabric more and more! So cute - I love this idea. Nice job Paige! What a really cute card!!! Happy Valentine's Day!